Big fish can live in strange places, and it takes a special drift boat to reach those waters. The all new redesigned ClackaCraft HeadHunter Skiff II with a wider higher transom was designed with over four years of ClackaCraft research and development along with extensive input from our Pro Staff and guides throughout the world. The HeadHunter Skiff is a versatile boat created for those waters that require a flat, low-slung drift boat that provides stealth and agility when the “big boys” are on the feed. If the fish you chase live in small, tight, windy, or remote areas, then the HeadHunter Skiff is the boat for you. 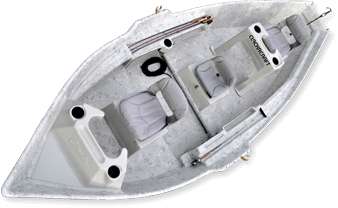 The HeadHunter Skiff comes well equipped with 360 interior, six pack rod holders, removable front and rear knee braces, as well as ClackCraft’s Exclusive Gulfstream® bottom and Tunnel Hull Technology. Engineered to work harmoniously together, this design has elevated the “row ability” of the boat to legendary status.